Pop & Glow Piano Musical Toy is rated 4.7 out of 5 by 46. Send your baby on their musical maiden voyage with the help of underwater friends. Watch and listen as your baby discovers their inner composer. This musical toy turns a colorful clam shell into a perfectly sized piano for your mini-maestro’s little hands. The Baby Einstein Pop & Glow Piano toy features 2 modes of play. In melody mode, enjoy beloved classical masterpieces re-imagined for your baby’s ears. In piano mode, your little one can create their own musical compositions. Each press of the large keys makes an underwater character pop out to play and dance across the stage. Dimension (in) 9.75" x 5" x 9.5"
Rated 5 out of 5 by Jackie22 from Holds her attention My daughter loves this. She will actually sit and play for a while, and now that we're learning colors I use it as a learning tool. It's awesome! Rated 5 out of 5 by AmandaP from Kids loved it - even in the box I couldn't even get this toy out of the box before the kids were banging on the keys! Lots of giggles followed. It held up to the rough play, too. Rated 4 out of 5 by Dmb1031 from Loved it but... My child loved this toy but since it was tall he always toppled it over then pushed it around. Great lights and sounds though. Rated 5 out of 5 by Megan2724 from My kids love to make music with this toy. It is great for their hand eye coordination, and I love that the sounds it makes aren't annoying to a momma who spends all day hearing noisy toys. Rated 5 out of 5 by Megan2724 from My kids love to make musi My kids love to make music with this toy. It is great for their hand eye coordination, and I love that the sounds it makes aren't annoying to a momma who spends all day hearing noisy toys. Rated 5 out of 5 by Haleykali from Adorable Toy! This toy is bright and fun. My daughter who is 15 months loves it! Its a mini piano that has adorable sea creatures that float around when you press the keys. I'll even catch my son (who is 3) playing with it. Its also great because its small enough that you can bring it on the go. Rated 5 out of 5 by ChristianaMamarazzi from LOVE LOVE LOVE! This little pop&glow is SUPER cute! 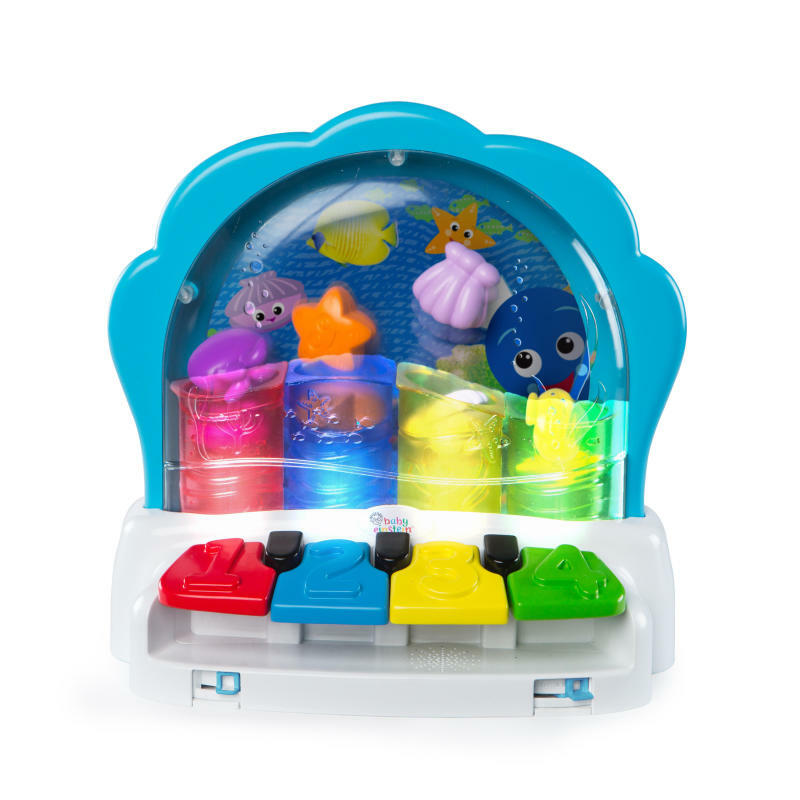 My daughters were immediately enthralled by this, and loved that it lights up different colors when you push the keys and plays different notes and songs. It's really cool and you can make a little game out of it too- like seeing if you can pop the little characters in different holes. Overall, this is really really cute and entertaining!